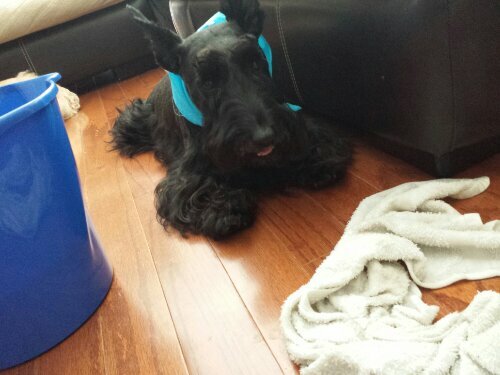 This weekend, it was all about cleaning and getting things in order in The Scottie House. 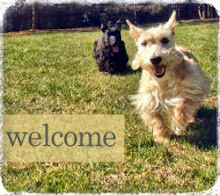 I decided to be Scottie Mom's special helper. I supervised the floor washing and let her know when she missed a spot or if something needed a little TLC by decorating the floor with my pawprints. Without a doubt, washing the floors is one of my favorite chores to do with Scottie Mom. She gets on Scottie eye level and together, we move about on all fours making the floors extra zoomie-friendly. Scottie Dad says he's not sure why she doesn't just pull me by my tail and let me and my skirt do all the work. While it sounds like a fun game to me, Scottie Mom gave Scottie Dad "the look." Apparently, she wasn't as fond of the idea as I was. Wonder why? Next, we tackled the laundry and sorted through Scottie Mom's wardrobe to see what we could donate to those in need. 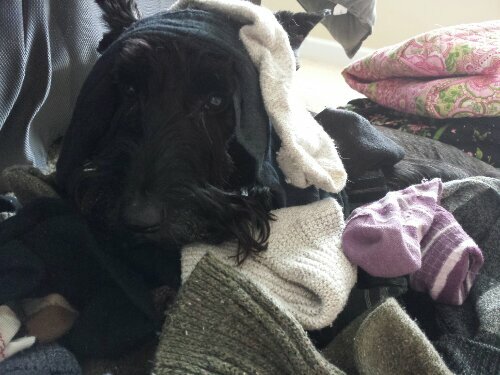 My self-appointed job was to oversee the sorting of the socks. I did my best to match them up but some were too fun, I had to stash them away for play time later on. (Shh... Scottie Mom still doesn't know why some of her socks are missing their match!) Anyway, as you can see from the photo of my impressive on-the-job skills, I dig deep and make sure no sock goes unturned. Last, but not least, I did an audit of Scottie items present in each room - arguably the most important chore of the day. 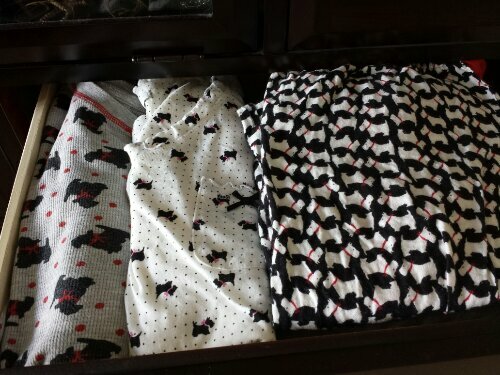 The master suite passed: I found a whole drawer of Scottie pajamas! The guest bedroom also passed because that's where Heather and I have our own master suite. Next, I investigated the kitchen where I found a whole shelve of Scottie dishes AND an entire island full of food, treats, and toys for two Scotties. I'd say it passes with flying colors...don't you think? Stay tuned for tomorrow when Heather unveils the other project we helped Scottie Mom and Dad with this weekend. 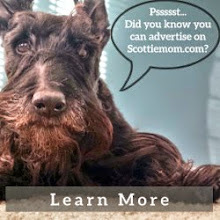 Trust me, Scottie Moms, if you're anything like my Scottie Mom, you're going to LOVE it! Until next time, Mr. K.
Good job pupevising the house chores. I like help'n with the socks best. wow you've been busy. 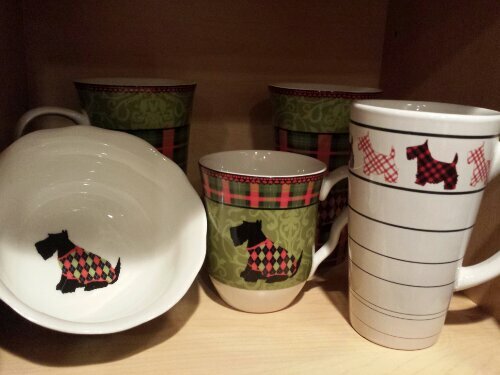 you need to make a batch of scottie shaped biscuits and have a cup of tea using the mug! happy to know i am not the only scottie mom with a ridiculous amount of scottie pjs! It passes as a start. Scottie Mom isn't obsessive about Scottie stuff yet. She doesn't have at least one of everything. My peeps are working on their collection. Haggis and Lucy also likes sorting the socks - Lucy has a secret ladies underwear fetish (and a not-so-secret passion for shoes) and has cost her mom a small fortune in bra's and shoes. Good job guys!! We hope you were rewarded with LOTS of treats and tummy rubs - you must've been exhausted afterwards! I have some of those pajamas!